Seed Phytonutrients' bottles on display at Ecologic's factory in Manteca, California. Inspired by the then-new iPhone’s curved fiber nesting tray and the Canadian milk pouches of her youth, Corbett envisioned an environmentally-friendly bottle with an outer shell of recycled paper concealing a thin, plastic, recycled liner inside. The concept could, she believed, reduce carbon emissions by more than a third. Turning it into a full-fledged company, however, proved an uphill climb. “Potential investors thought I was just some chick from Berkeley who didn’t know what she was talking about,” Corbett says. Until, that is, she ran a successful test pilot with a local dairy at an Oakland Whole Foods. 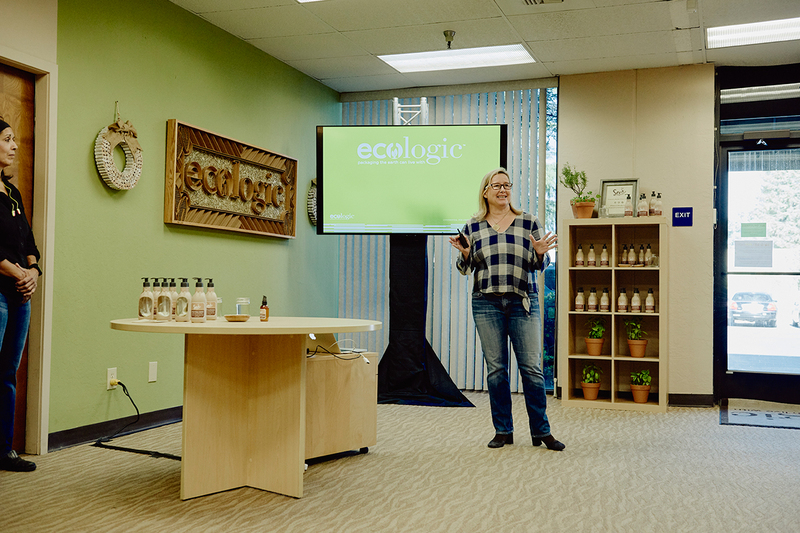 Julie Corbett, president and founder of Ecologic, tells her story at the company’s factory in Manteca, California. By 2013, Corbett’s enterprise, Ecologic, claimed a bustling a factory in Manteca, California, and a client list that included Seventh Generation and Nestlé. Business appeared to be booming. In truth? “We struggled to find the right technology, equipment, and people,” she admits, explaining that Ecologic relied too heavily on manual labor and found it impossible to scale. So focused was the company on fixing the manufacturing process that they began ignoring calls and emails from potential clients – among them, Scott Schienvar, head of supply chain operations at L’Oreal. Schienvar isn’t exaggerating: When his emails to Corbett went unanswered, he contacted her on – where else? – Facebook. “I got a Facebook message from Scott going, ‘Please call,'” Corbett says. “Then 10 minutes later, I got another message. I thought, ‘I should call this guy back, because at this point, I’m being rude.” Though she planned to let him down politely, Schienvar proved persistent. “We’re coming to Manteca to see you,” he said. Shane Wolf, Seed Phytonutrients’ founder, speaks at a tour of Ecologic’s facility. Within days, he and Seed’s founder, Shane Wolf, were sitting down in California with Corbett and Greg Rodrigues, Ecologic’s new CEO, whose experience in manufacturing has helped transform the company. 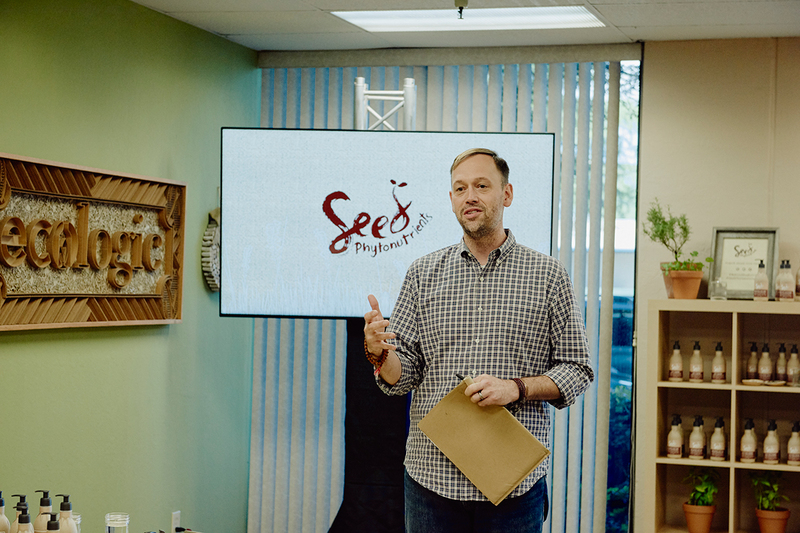 Seed’s message immediately resonated and they believed – “Shane’s vision is authentic,” Corbett said – but could Ecologic handle the volume required? 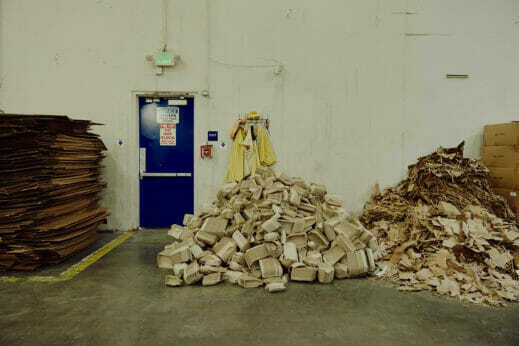 Even if they could, Shane wanted things they couldn’t yet deliver: The packaging had to be recyclable and compostable – that meant glue was out. 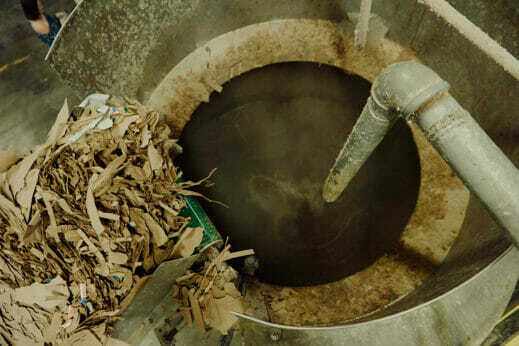 It also had to withstand a hot shower environment – when an uncoated paper container gets wet, it becomes soggy and falls apart, especially when shampoo suds further weaken the structure. And to reduce waste, the plastic pouch needed to be thinner than any other on the market. Paper that will be turned into Seed Phytonutrients bottles. Wolf remembers the meeting well. “They needed a big influx to help them move their technology from something that was labor-intensive to something sustainable from a business perspective.” His proposal: He’d provide funding to develop a new packaging concept if Ecologic agreed to meet their ecological requests. 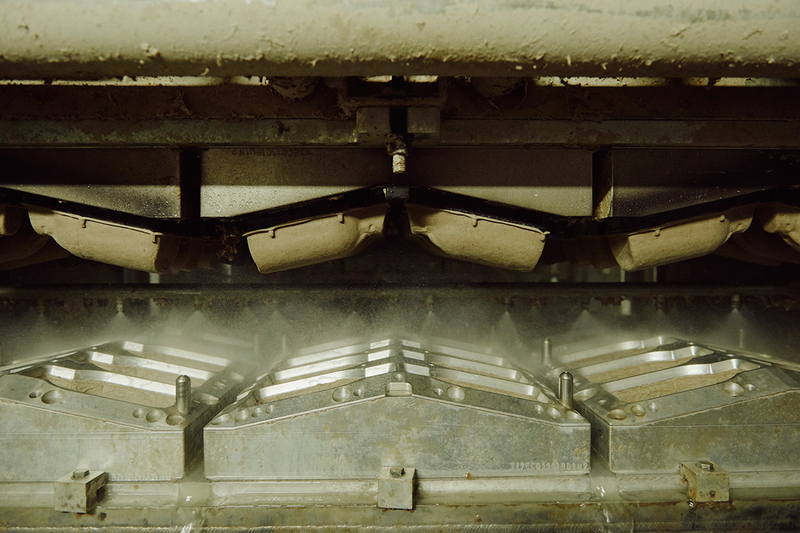 Specially designed molds transform a fibrous paste into the sturdy paper packaging for Seed Phytonutrients. These bottles have an interlocking closure, which eliminates the need for glue. Corbett was game. “We approached it one step at a time,” she says. By adding a combination of earth minerals, they created a water-resistant paper bottle that could stand up to the pressures of a shower. Instead of glue, the bottle uses a clever interlocking design that’s just as sturdy. The interior liner (made with food-grade recycled plastic) is 60 percent thinner than typical plastic bottles. A unique pump evacuates up to 98 percent of the available shampoo – a consumer-pleasing innovation that also lightens the carbon footprint. What’s more, the containers can be shipped nested, making them far more efficient to transport than traditional packaging. The resulting bottle just may be the most ecologically sound in the world of beauty. “It’s totally new – nobody has done this in our industry,” Schienvar says. “It’s stylish, it’s clean-looking, it’s a really strong bottle.” Each one comes with a hidden gift inside, too: a packet of organic seeds from the Hudson Valley Seed Company, a farm-based heirloom seed producer in upstate New York, meant to encourage consumers to grow their own plants at home and participate in the cycle. As proud as the Seed and Ecologic teams are of their accomplishment, this is just the beginning. “We use post-consumer paper now,” Schienvar says. 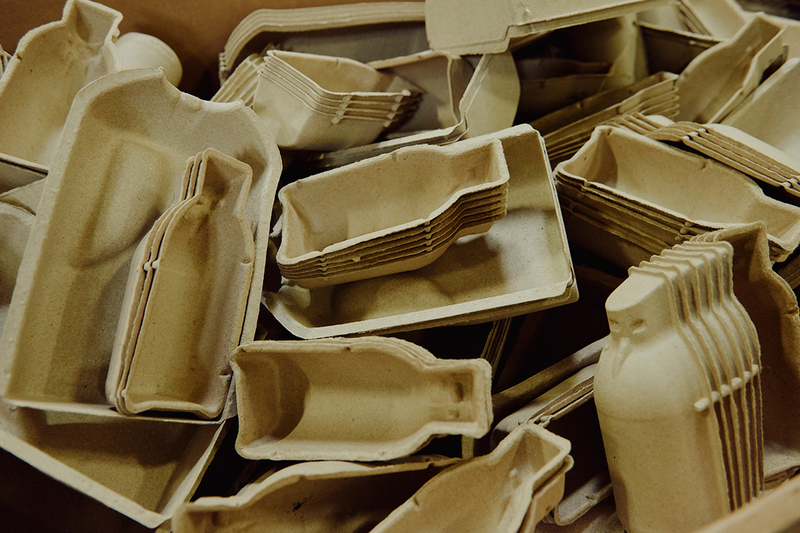 “But soon, we’ll be making these containers from our own waste paper and cardboard boxes.” That will then create a closed loop, which will bring Seed one step closer to the ideal vision of zero waste. The inner part of Seed Phytonutrients’ bottles is just as smart. The plastic liner is so thin – 95 percent thinner than conventional bottles – that it collapses as it’s used. Its unique design uses fewer resources and allows consumers to use almost every drop of product. “This is truthfully one of the biggest innovations in terms of lightening the carbon footprint,” Corbett says.